The bright red of Indian paintbrush colors our native prairielands. Indian paintbrush has hairy, upright stems with flowers clustered at the top. The actual flowers are inconspicuous, tubular, greenish-yellow, and nestled in the axils of the brilliantly colored bracts, which can be red, orange, or yellow. Blooms April–July. Basal leaves formed during first year, short, oblong, with rounded ends. Stem leaves alternate, stalkless, narrow to linear to 3-lobed with the central lobe wider and longer than the other 2. Both leaf types are very hairy. Similar species: There are two other species of Castilleja in Missouri, both Species of Conservation Concern. Downy painted cup (C. sessiliflora) lacks the "paint," with only green bracts surrounding the flowers; its flowers protrude noticeably beyond the bracts. It's found only in our far northwestern counties. Purple paintbrush (C. purpurea) has purple bracts instead of red and has clustered flowering stems. Rare and known only from a few locations in southwestern Missouri, it may not occur in our state anymore. Height: usually about 8–15 inches; sometimes taller. Some Indian paintbrush plants have yellow instead of orangish red bracts. Consider yourself lucky when you find one! A plant of very dry and also wet situations. Occurs in fields, prairies, and glades; also in seepy areas, wet soil along streams, and moist thickets. Castilleja may penetrate the roots of other plants and act as a parasite, but it does not depend on this lifestyle for survival. 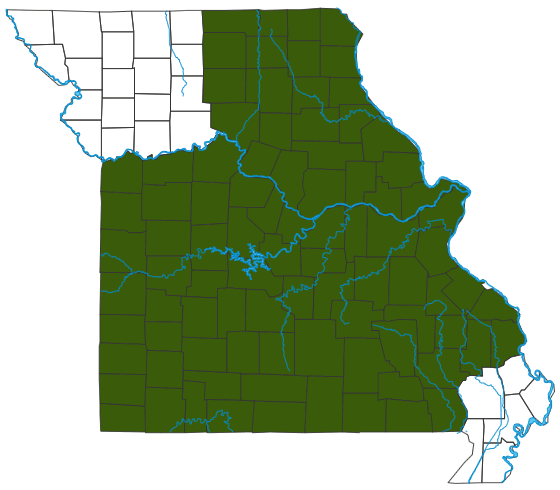 Statewide, except for northwestern Missouri and southeastern lowlands. Also called painted cup and Indian blanket. Botanists have been busy with the new information coming from molecular research. The traditional figwort family of penstemons, snapdragons, and others (Scrophulariaceae) has been "disintegrated" into several new, smaller families, and many former "scrophs" have been transferred into other, existing families. Indian paintbrush is now grouped with the broomrapes in the Orobanchaceae. Native Americans used this plant for medicinal and other uses, but the name "Indian paintbrush" seems to come from fanciful or legendary ideas based on the brightly colored bracts. This plant is difficult to establish and grow in a garden. Indian paintbrushes are partial root parasites, attaching their roots to the roots of nearby plants and tapping their nutrients. Most commonly parasitized are little bluestem, penstemons, and prairie blue-eyed grass.